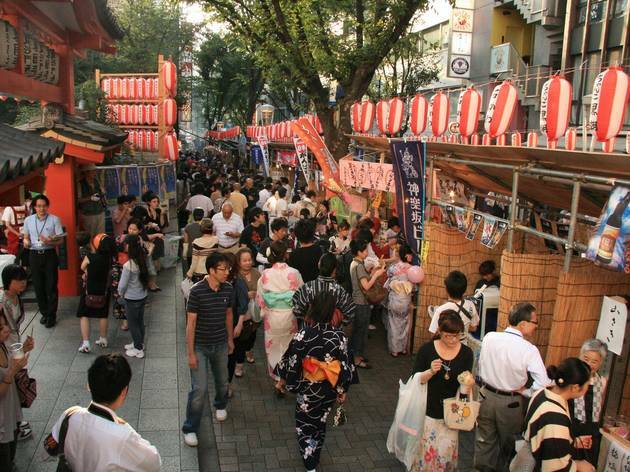 Usually one of Tokyo's most refined neighbourhoods, Kagurazaka gets a little unruly each July, as hordes of yukata wearers and awaodori dancers flood the streets for four days of traditional festivities. 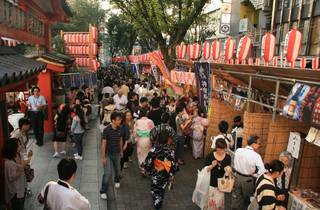 On the first two evenings of the Kagurazaka Matsuri, you can pick up a Chinese lantern plant at the market in Bishamonten (Zenkokuji) temple, as well as join a guided tour of the area (which includes a free commemorative snap if you're wearing a yukata). But the main action comes on Friday and Saturday evenings, when teams of dancers make their way along Waseda-Dori from Iidabashi and Kagurazaka stations, converging at the central crossing.